Lynn, yes I understand what you are trying to say here regarding those indivual sentences. But when you start considering the sentences together then you will get confronted that his ideas do not really make sense. "... a vertical ridge would be going with the growth of the nail in one place." I think this is actually rethoric nonsense, because he sort of describes here that a vertical ridge 'would be going' where the vertical ridge is going!!! '...usually easy to see and somewhat less common'. ... easy to see than what? ... and less common than what? The answer can only be that he is suggesting in his first comment that vertical ridges are more easy to seen and less common than horizontal ridges... however, I think you and I know very well that the reverse is usually true! Lynn, do you now finally recognize as well how confusing his ideas really are? PS. The so-called 'common sense' that he wrote about vertical ridges only showed up AFTER I started discussing the issue explicitly... but I also noticed that those comments were followed by other conflicting statements regarding the difference between vertical and horizontal ridges. So, I think he is basically sort of only thinking out loud as we confronted him with quite a few objections (from my side) and questions (from your side). Yes sorry i meant Lori's example. sorry for the confusion. I concluded that the horizantal ridges in Lori's example are more pronounced than the vertical ones. Considering I have seen the extremes of both spectrums of vertical and horizontal ridges. One or two prounounced verticle ridges are less developed considering there is only one or two pronounced ridges than the waves of horizontal ridges covering the entire nail. Basically there are more horizontal ridges than verticle. It takes time to develope these ridges also. Because the horizontal ridges are more pronounced and there is more of them simply means they have been in developement for a longer period of time. Also liver damage is a set in disease which takes longer to form. While people with a liver disease have almost solely verticle ridges. No, what i mean is verticle ridges that indicate health problems are somewhat less common than horizontal ridges. Simply because horizontal ridges have a more overall reflection on a persons health so it would start with a horizontal ridge and could lead to a vertical ridge that would indicate a health problem. That seems to be Lori's case. Heres some info on how the liver and kidneys work. Basically the liver filters what the kidney's cannot. I would say the vertical lines are somewhat of a result of the liver and kidneys not functioning well together. The verticle ridges becoming enhanced with age and set in of disease. Look at the case of Beau's lines, verticle ridges and psoriasis, in lower link. hi tarotmancer, thanks for your reply, seems you added to it since I saw your original reply to my msg was only about Lori's hands. Many thanks for adding your thoughts. It is late here, so I will reply to you tomorrow. However from my experience I disagree that vertical ridges (that indicate health problems) are somewhat less common than horizontal ridges. Many more people have vertical than horizontal ridges. However I notice your point about "vertical ridges that indicate health problems". How do you differentiate between vertical ridges that indicate health problems vs vertical ridges that don't indicate health problems? Martijn (admin) wrote: Lynn, do you now finally recognize as well how confusing his ideas really are? I was also confused by some of tarotmancer's points, but I think some of it was due to confusing explanations/words rather than his ideas (?). Martijn, I hope we can concentrate less on some of the apparently confusing words (is it called semantics?) and focus more on the ideas behind it. I would like to hear more about what tarotmancer has to say about nail ridges. Tarotmancer, sorry for talking about you as if you aint here! I notice you posted a link to a scientific paper from pubmed about direction of nail growth being controversial, that shows me that you have a serious interest in the subject, even tho we have started off by misunderstandings due to some use of language/chosen words! travelingtarotmancer wrote: While vertical ridges (twoards tip) indicate liver problems usually shows up on people with hepatitis or drinking problems. These are usually easy to see and somewhat less common. Do you see any liver related issues with these nails? He is diagnosed with cancer of the liver. Basically there are more horizontal ridges than verticle. It takes time to develope these ridges also. Because the horizontal ridges are more pronounced and there is more of them simply means they have been in developement for a longer period of time. I guess you are aware that on average it takes about 5 to 6 months for a nail to grow from the proximal nail bed to where it breaks away from the quick distally. That means the nail continuously forms at the bed and grows out. Horizontal ridges (unless caused by outside injury) are formed at the bed and grow out. They reflect the state of the body (physically and emotionally) at the time they are being formed. These horizontal ridges are limited to the period of time they have formed in. Wider the ridge the longer the period of time. Vertical ridges would form in the horizontal ridges because they are growing out from an area that has a template of sorts. I say this because the vertical ridges are continuous and not random proximal-distally. Your remark that the horizontal ridges are more common than vertical can possibly be justified in the sense of growth 'rings'. Markings that can be seen on horn, beaks, claws or old people's big toe nails Is this what you are trying to describe here when you say they are more common? Of course damaged nail bed tissue can cause the nail to either appear detached as it grows over the scarred area or rise and lower to match the contours. When I was very young my brother reached across the kitchen table and grabbed my hand for some reason and his nail scrapped off a chunk of skin at the base of my cuticle. I was about 9. As the nail grew out there has always been a groove with a ridge on each side growing out from where the skin is scarred - still there many decades later. Now there are a few more vertical ridges along side it appearing as I got older. Seeing this on my nail leads me to believe that over time we damage and scar the cuticles of our nails and the nails as they grow out reflect this. p.s. : I have Enid Hoffman's book and just reread that chapter. This is one of the books I read from cover to cover when I first started reading hands in the early 80's and the information that she shares about the nail ridges is pretty much the basis of where I first got my information. I am in agreement with what she writes as it as played out as accurate in my experience. My edition is 1983. Thought I'd share my experience on vertical ridges. After having improved my nutrition and sensitivity to stress, the vertical ridges have diminished significantly. They didn't diminish uniformly but rather the new nail was much smoother. So at some point the top half of nail had deeper and messier markings than the bottom half. It was fun watching the birth of health. Interesting! I can't recall having a horizontal ridge either. Lucky me, I guess. the bottom half. It was fun watching the birth of health. that's interesting, I've never seen vertical ridges on just top or lower half of the nail! Or maybe she just has a bad memory;) ! No I really don't remember ever having a horizontal ridge (or Beau's lines as I was originally taught). I thought it had to be some quite traumatic event (physical or emotional) for a horizontal ridge to appear (as opposed to general day-to-day stress) and luckily I haven't experienced it. I thought it was mainly stress or trauma too. But, in December I broke my little finger nail partially off below the quick and bandaided it together for a couple of weeks while it grew out. It finally grew out enough to clip off and when it did I saw a deep ridge starting to grow. So, apparently just trauma to the finger itself can cause a ridge. Or wearing a bandaid over the nail. It's my right hand and I tried to photograph it yesterday but can't hold the camera steady with my left! I wish I took photos! The ridges didn't disappear, they improved significantly though on the new part of the nail. - arthritis, kidney problems, anemia (iron deficiency), and arteriosclerosis. 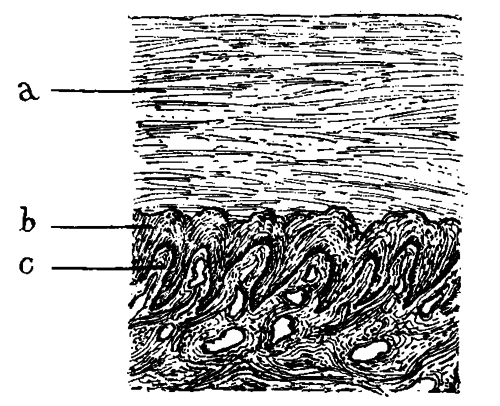 Beaven & Brooks describe a conncection between 'vertical (longitudinal) ridges' with chronic obstructive airways. A, The Nail; B, The Rete Mucosum; C, The Longitudinal Ridges Of The Corium. In response to the discussion earlier this week, I have written an article presenting a proper & more detailed treatise about how to understand the nature of the vertical ridges in general + how to discriminate the pathological variants from the variants within the normal range of vertical ridges. Lynn wrote: hi tarotmancer, thanks for your reply, seems you added to it since I saw your original reply to my msg was only about Lori's hands. Many thanks for adding your thoughts. It is late here, so I will reply to you tomorrow. Verticle ridges that indicate health problems are extremely pronounced. I beleive this quote (in the top link) "regulation of blood levels of amino acids, which form the building blocks of proteins" on how the liver works has something to do with how the liver helps form proteins, that if it malfunctioned would probably cause verticle lines in the nails. Because the liver has to do with the actual formation of the proteins not the kidneys. what i mean is verticle ridges that indicate health problems are somewhat less common than horizontal ridges. Simply because horizontal ridges have a more overall reflection on a persons health so it would start with a horizontal ridge and could lead to a vertical ridge that would indicate a health problem. That seems to be Lori's case. I beleive this quote (in the top link) "regulation of blood levels of amino acids, which form the building blocks of proteins" on how the liver works has something to do with how the liver helps form proteins, that if it malfunctioned would probably cause verticle lines in the nails. Because the liver has to do with the actual formation of the proteins not the kidneys. In the case of Bau's lines high acidity in the blood can cause problems such as lowering the immune system leading to any range of acute or moderate illnesses. I have personally found that I can monitor my own blood acidity by feeling the horizontal ridges in my nails. I have also read both of these subjects in a book i beleive to be this one http://www.alibris.com/booksearch.detail?invid=10962219045&browse=1&qwork=2803141&qsort=&page=1. Sorry Tarotmancer, your 'believe' simply still doesn't make sense to me, because your 1st source does not relate to nails (nor the vertical ridges), and your 2nd source also does not suggest that there is a link between liver problems and vertical ridges. PS. Especially in the past authors of palmistry books have often presented theories about how medical problems manifest in the hand; but usually it is hard to say whether these theories should be treated as representing 'hard evidence', 'speculative explorations', 'passages copied from other sources', or 'anecdotal evidence'. Therefore I would recommend you to treat those materials in palmistry books with caution - especially when medical sources have not presented any confirming evidence for a specific theory, like we have seen in your example. PPS. If you still think that you found (anecdotal) evidence for your theory in cases of liver problems... then IF your assessment of the nail characteristics itself was correct, maybe you should consider the possibility of a 'spurious link' between the disease and your observation. I hope this suggestion makes sense for you. The curvature in nails is said to be due to heart, liver, and/or respiritory problems. 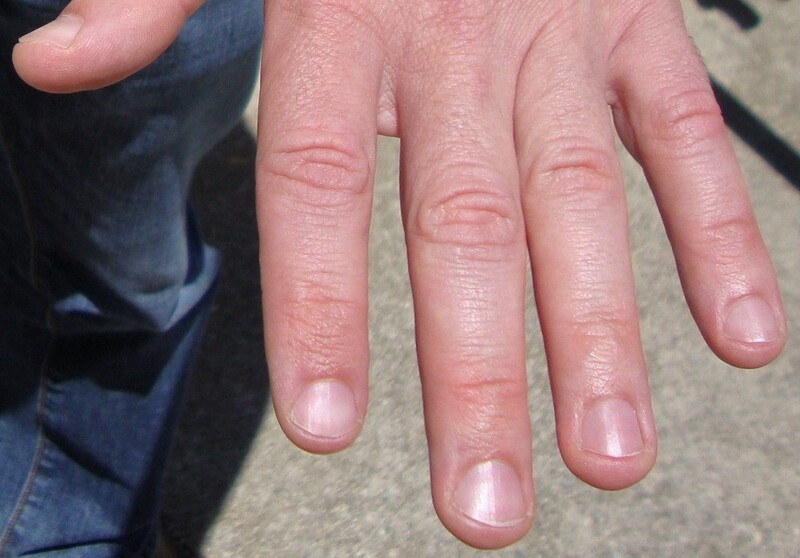 The yellowing of the nail has been linked to liver, lymphatic, and/or respiritory problems. The vertical ridges have been associated with kidney disorders, iron deficiancy, arthritis, and/or age. Horizontal ridges with minor illness or trauma. Anemia has been said to be caused by kidney and liver problems. Liver disease leads to kidney disease. Kidney disease is commonly caused by diabetes type 1 and 2 as, well as hepatitis b and c (both liver related diseases). In conclusion I believe vertical ridges have something to do with the liver and kidneys not functioning well together as i have said in my previous statement. I found this conclusion because the minor problems associated with vertical ridges i.e. arthritis and anemia are caused by Kidney and/or liver problems. The real problem here is not having a few cases to study with vertical ridges.I have learned from personal experience vertical ridges usually indicate liver problems especially with age. 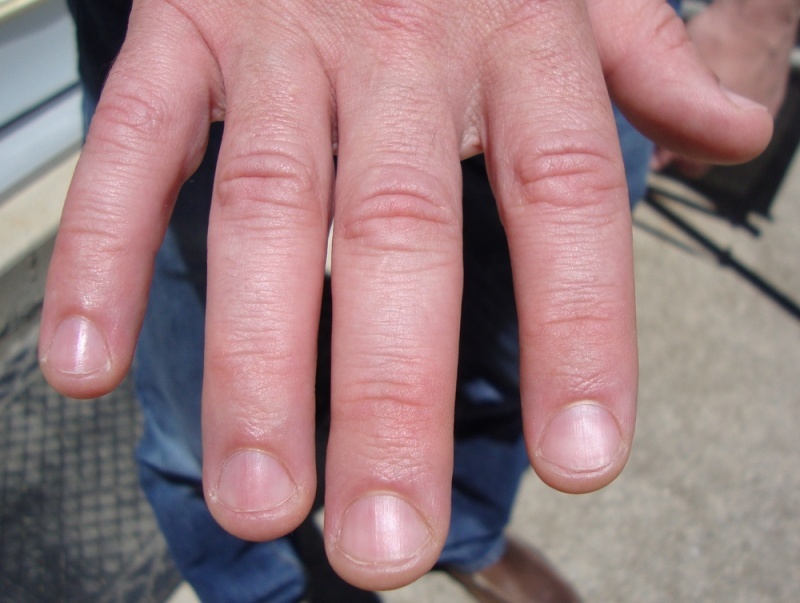 "VERTICAL NAIL RIDGES IN THE ELDERLY"
do you have any links that explain this?..... "Anemia leads to arthritis." they will certainly remain in my consciousness for some time... the chronic stress certainly has multiple impacts in people of all ages including, in the development of expanded waistlines. This is important as many assume the person has bad diet habits, but is a strong indicator of an unbalance of the hypothalamus/ pituatary/adrenal axis through stress. This then triggers the cortisol production and in your case leading to adrenal exhaustion- the reason I came across this was due to research for my chosen student's essay in Psychology on depression and suicide in rural areas. I always use this to gain some insight as to when whether stressors may have been present when horizontal ridges are present, though often it can also be post trauma, and chemotherapy. But also would like to ask Martjin about pearl drop- or string of beads line/vertical, I remeber vaguely they can indicate rheumatism? If there is 'no evidence' of a connectin between nail appearance and liver disease, it can also mean there has been no research or easily accessable research in that area... perhaps you could go to a forum of people living with liver disease and ask, after explaining why, if people would post photos of their nails, and changes that may have occured... you need at least 30 for a basic quanititative study. By 'spurious' Martjin means, I am sure helpfully though a little bluntly, that you have drawn an association that may have a third or fourth factor, of which you are unaware, impacting on the nails. It would be a good exercise to keep photographic records, with permission and respecting privacy, along with a brief case history of exposure to drugs, medications ,trauma etc. Thanks. I have corrected the errors. Yes Felicity, that is correct. But I would prefer to consider 'nail beading' (which requires little bumps to be present on the surface of the nail - usually only on a minor surface of the nail) as a separate topic... not to be confused with nail ridges. PS. Nail beading has also been associated with e.g. Diabetes mellitus, Thyroid disorders, Addison's disease, and Vitamin B deficiency.